Free AAC to MP3 Converter software can help you to convert AAC files to MP3 audio, or decode MP3 to AAC format. This audio converter provides you the easier way to convert AAC to MP3 with ultra speed and outstanding quality. 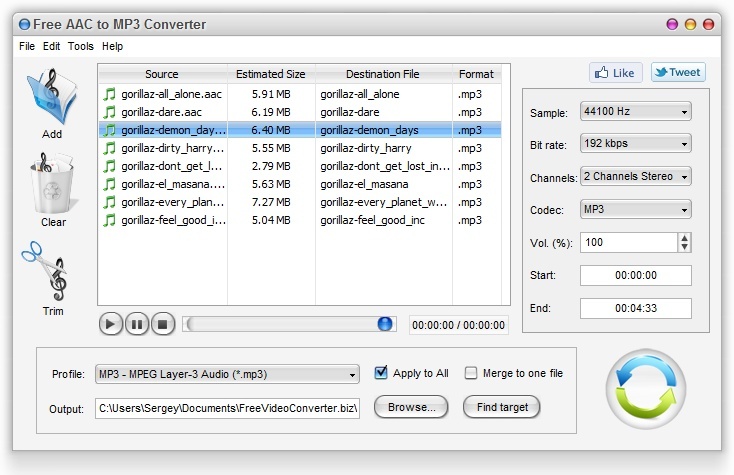 The AAC to MP3 Converter allows you to merge output files, cut any part of audio, customize output so that you will always get the best results of conversion. ...... This program also allows you to convert your audio to the most popular audio format in the world - MP3. 1. Convert AAC to MP3. In addition, you are enabled to convert MP3 music to AAC format. 2. Convert only a fragment of the video using the Trim function. 3. Optimized settings of audio formats. Advanced settings for professional user. 4. Playback music before conversion. 5. Pretty-lookin skin, user-friendly interface. 6. Windows 7 is supported. Remove the DRM protection of protected and unprotected formats. Qweas is providing links to Free AAC to MP3 Converter 1.0 as a courtesy, and makes no representations regarding Free AAC to MP3 Converter or any other applications or any information related thereto. Any questions, complaints or claims regarding this application Free AAC to MP3 Converter 1.0 must be directed to the appropriate software vendor. You may click the publisher link of Free AAC to MP3 Converter on the top of this page to get more details about the vendor.